Meant not only to educate but also to collect stories, the new redlining exhibit at the Blair Caldwell Library in Denver will be up through most of December. 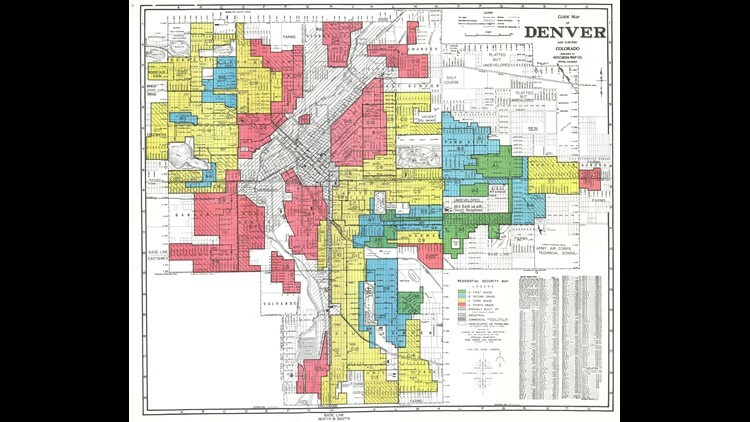 Before gentrification came to Denver, many neighborhoods had to deal with the practice of redlining. An exhibit running at the Blair Caldwell Library right now in Five Points is focused on the idea of redlining and how it's still impacting Denver's neighborhoods. Redlining, first started in the '30s, is when people in certain neighborhoods were denied mortgage loans - or said mortgages were made very difficult to obtain. The exhibit "Undesign the Redline" has come to Denver thanks in large part to her effort. Its point is to raise awareness about redlining and record people's stories about it. She said the federal government mapped out more than 200 cities across the U.S. - including Denver - and put some areas inside the "red line." "Red areas were considered 'red-lined' where the federal government wouldn't lend in those areas because there were undesirable elements," Rodgers told 9NEWS. Professor Glenn Mueller at the Burns School of Real Estate and Construction Management at the University of Denver said the federal government really used red ink to map out cities. They would decide which neighborhoods weren't good investments based on crime rates, unemployment rates and how many people might default on loans, Mueller explained. The Fair Housing Act passed in 1968 was meant to ban discriminatory lending practices, both Mueller and Rodgers said there’s still a ripple effect. Denver's redline map includes areas like Five Points, Elyria Swansea and Sunnyside. You can see a detailed version of the map and zoom in on a street-by-street level at this link. "Areas like the Five Points area," Rodgers said, "where they have really gentrified quickly in the past five years - the home-ownership rate for African American households have gone from 70 percent to 20 percent." - The median household income is lower than Denver's. - The percentage of renter-occupied units is higher than Denver's. - The percent of residents with less than a bachelor's degree is higher than Denver's. The exhibit at Blair Caldwell Library is not only meant to educate but to also collect people's stories, including Jacquelyn Clemmon’s family. Clemmons said her husband’s family has been in Colorado for four generations. Clemmons said it was a combination of both rent prices going up as well as property taxes. "You lose your community," Clemmons said. "With redlining, it's not just your home." She said over time her husband’s extended family started scattering over the metro area. She and her family have chosen to settle down in Aurora. Clemmons said she hopes people will take in the exhibit not only to learn about redlining but to also be motivated to take action. "There are things that can be done when there is zoning voted on by City Council, all kinds of things that happen years in advance," Clemmons said. "If people are aware of things on the table in their neighborhood, if they contribute their voice, they would have more say or knowledge of what's going on." The "Undesign the Redline" exhibit will be at the Blair Caldwell library until Dec.16. It will then move to the atrium of the Wellington Web building in downtown Denver from Dec. 18 to Jan. 2. It's free to enter.